176 pages | 28 B/W Illus. Ship management is a worldwide activity. Modern ships are sophisticated designed structures equipped with several automatic devices. It is estimated that 90 per cent of commodities transported worldwide are carried by ships. Therefore there is great interest from many private and public organizations that those ships are operating, manned, designed and maintained within international acceptable standards. The obligation of stakeholders to comply with maritime regulations is included in most statutory and commercial agreements and therefore inadequate implementation of maritime regulations exposes stakeholders to commercial risks. This book explores how the application of mathematical decision-making tools could be used to manage maritime regulations. Performance management tools are proposed which would allow stakeholders to monitor the regulatory performance of their organization in order to reduce or eliminate those commercial risks. 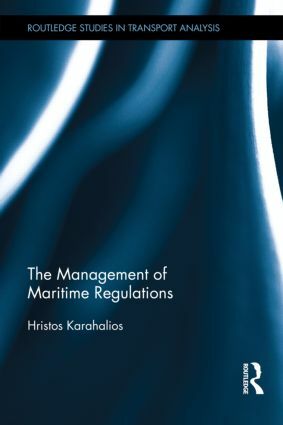 The process of introducing an implementation process for maritime regulations worldwide is described within this text. An emphasis is put on the role of main stakeholders in the regulatory process and reasons that increase the willingness of stakeholders to participate in the implementation of regulations. This book will be of interest to scholars and students interested in the management of the shipping industry as well as ship owners and managers who are charged with implementing maritime regulations. Hristos Karahalios is Maritime Consultant in the fields of Ship Management and Quality Control, Piraeus, Greece.